Property 9: Air-conditioned villa located in a land with trees and private pool. Property 18: Gite Le Vieux Pressoir, Montlaur. Near Carcassonne. In the heart of the Corbières. Property 20: Medieval village - house with all mod cons! Property 23: Little house in the heart of "les corbières". Property 26: Converted Wine Cave With Small Court yard in the village of Labastide en Val. Property 45: Domaine Le Piboul "Les Cuves"
Domaine Le Piboul "Le Director"
Property 46: Domaine Le Piboul "Le Director"
Character gite with swimming pool, surrounded by vineyards, 30 min drive from the Mediterranean coast. Property 50: Character gite with swimming pool, surrounded by vineyards, 30 min drive from the Mediterranean coast. 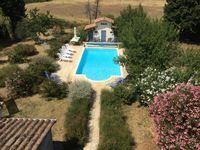 It is possible to have a wonderfully peaceful holiday in the south of France even at the height of the holiday season in August! Elaine&rsquo;s house is set in remote but beautiful countryside opposite the Villemagne cave amid rows of vines and rolling hills. It has the advantage of a secluded private pool set in a rambling garden with fruit trees and shrubs with views of the surrounding countryside. It&rsquo;s not overlooked at all and the only sounds you hear are birds and tractors. The house itself is simple but comfortable. All the bedrooms are large so there&rsquo;s no arguments about who gets the best room while no ensuites means all the bathrooms can be used by everyone. The house is very homely. It&rsquo;s easy and just works. The only downside was a brief flood in the kitchen due to a heavy downpour and some dodgy drainage but it all passed quickly. All in all, a peaceful and relaxing holiday enjoyed enormously by everyone, even our grumpy teenagers. Cute rental in a quaint and kind little French town. In the sweet little town of Ferrals-Les-Corbi&egrave;res, you'll find this rustic, yet modern rental, with quiet nights and bustling days. The rental is cool even though un-airconditioned. We especially loved the &quot;patio.&quot; Perfect tea pot and french press. The WIFI was very reliable and strong. A few things to be aware of: There a few plug-ins in the house (none in the bathrooms) and the parking is a fun search upon return back to town. Very close is L&eacute;zignan-Corbi&egrave;res. On the way there are large grocery stores (the market on Wednesdays shouldn't be missed) and great shopping. 20 minutes away to the North is Carcassonne and 10 minutes more North is Toulouse. 15/20 minutes to the South you'll find Narbonne and 5 minutes more the coast (we like Chalet beach). There are many wineries very close (including Maylandie - a MUST!) and even more with in a 15 minute drive (check out Abbaye Fontfroide, Famille Fabre and Ch&acirc;teau Grand Caumont). There are 2 excellent and highly recommended restaurants (Bembe, across the street, for grilled food and La Crimiti for fine dining). The people in the Grocery and Tobac and super helpful. The most important thing to us was the community of lovely people that treated us like family. Everyone greets you kindly and wants to talk. On Father's Day, we were blessed to participate in a town event of a walk through the vineyards (this included pastries &amp; coffee and a snack mid-walk) and lunch. The president of the walking club joined us and showed us special sites and breath-taking views of the area. At lunch, we were greeted and welcomed warmly, then joined in the delicious 4 course lunch and drank and talked with everyone. At the end, amongst the singing and merriment, the Mayor's wife gave us a painting by a local artist. We were deeply moved and will never forget our experience in F-L-C!